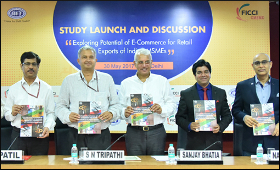 According to the study, "Exploring Potential of E-Commerce for Retail Exports of Indian MSMEs in Manufacturing Sector", the total potential for business to consumer (B2C) e-commerce retail exports from India is estimated at approximately USD 26 billion, of which USD 2 billion can be achieved by 2020 from 16 product categories. Referring to various initiatives of the government of India, such as "Zero Defect Zero Effect", Tripathi said the MSMEs should take advantage of schemes to improve the quality of their products and scale up their business, adding that the government was working towards improving ease of doing business and addressing various challenges faced by MSMEs. "There is no way we can undermine the contribution of MSMEs to our economy and it is in fact very important that we continue to explore synergies to integrate this very important sector with the latest emerging trends. E-commerce is one such trend which is massively changing the mechanism of global businesses," said Sanjay Bhatia, President, FICCI-CMSME. "We are positive that together with FICCI and IIFT, we will be able to initiate dialogues at policy level to ease norms for e-commerce retail exports and encourage larger MSME base to tap the potential of e-commerce," said Navin Mistry, Director Retail Exports, eBay India. The study also highlighted policy recommendations towards integrating "Make in India" and "Digital India", which will enable access to new geographies and market diversification for the Indian MSMEs.